Start by cleaning a shovel with water only. 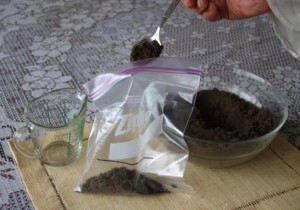 1) Scrape away the top layer of organic material until you see mineral soil. This is usually less than 2” down. 2) Dig a hole 6” (15 cm) deep. 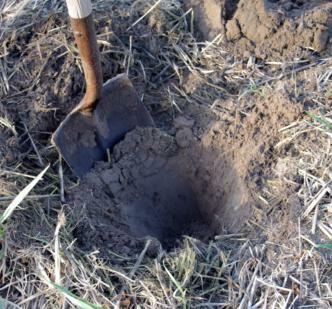 This is the default depth for a soil sample, and is where most of the roots of flowers and vegetables live. 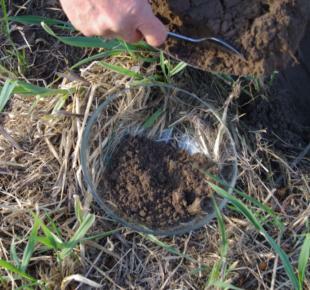 If you are in a no-till situation, like an orchard, dig a 3” (8 cm) deep hole and be sure to let your testing lab know the depth of the soil sample. 3) Using the shovel, slice a thin layer of soil from the side of the hole, from the top of the hole to the bottom of the hole. 4) Put an even section of this soil slice into a clean glass bowl. Stir it up with a clean stainless steel spoon. Avoid touching the soil with your fingers. Repeat steps 1-4 until you have a representative sampling. This is 6 to 15 holes, depending on the size of the area. 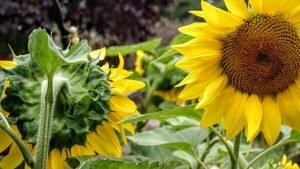 For a 100 square foot garden bed use 3 or 4 holes. Avoid atypical areas. This means avoid both the best and worst areas. 5) Take 2 cups (500 mL) of this mixture, and put it in a plastic bag. If it is really, really wet, you can let it air dry, but don’t put it in the oven. Label the bag with your name, your email address and the name of the sample (for example, “Veg Garden”). 6) Do a fizz test. Put two tablespoons (30 ml) of dry soil in a clean, dry bowl. Add a tablespoon (15 ml) of white vinegar (5% acetic acid). The amount of fizz is roughly proportional to the amount of carbonate in the soil. 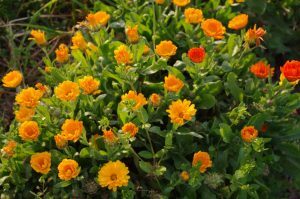 If you have put your ear right by the soil in order to hear anything (and you have normal hearing), your soil is not fizzy. 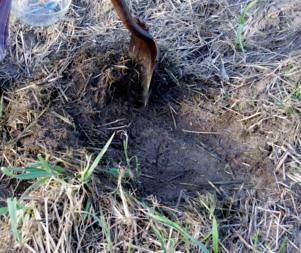 If you can see bubbles or easily hear fizzing, your soil is fizzy. If your soil is fizzy, get the AA 8.2 soil test rather than the standard.